The Armenian General Benevolent Union (AGBU), which is the world’s largest Armenian non-profit organization, hopes its new learning tool, WebTalks, will encourage a “more informed international dialogue” around topics in Armenian Genocide studies. Last month, AGBU WebTalks released a group of five short videos in honor of the Armenian Genocide that explore its various phases and legacy. Ranging from historical precursors to the contemporary ramifications of genocide denial, the videos aim to provide new, innovative learning tools by making the research of preeminent scholars, thinkers and writers accessible to the widest possible audience. AGBU says future videos will incorporate other phases of Armenian history-ancient and modern-as well as special aspects of Armenian culture. “Our goal with this group of videos is to educate and encourage a more informed international dialogue around topics in genocide studies. We hope that these videos will be used not only for self-instruction, but also in classrooms and at community events to inspire a new perspective on discussions of genocide, offering food for thought on how to grapple with genocide in the decades to come,” said AGBU Central Board Member Lena Sarkissian, who is also the Director of Program Development at the International Institute for Genocide and Human Rights at the Zoryan Institute, which collaborated with AGBU on the production of this group of videos. AGBU WebTalks, which debuted in January with five videos, produced in partnership with the Zoryan Institute, an international academic and scholarly center devoted to the documentation, study and dissemination of material related to issues of universal human rights, genocide, diasporas and Armenia, feature the insights of engaging, dynamic thinkers from around the world, speaking on a wide range of Armenian topics. 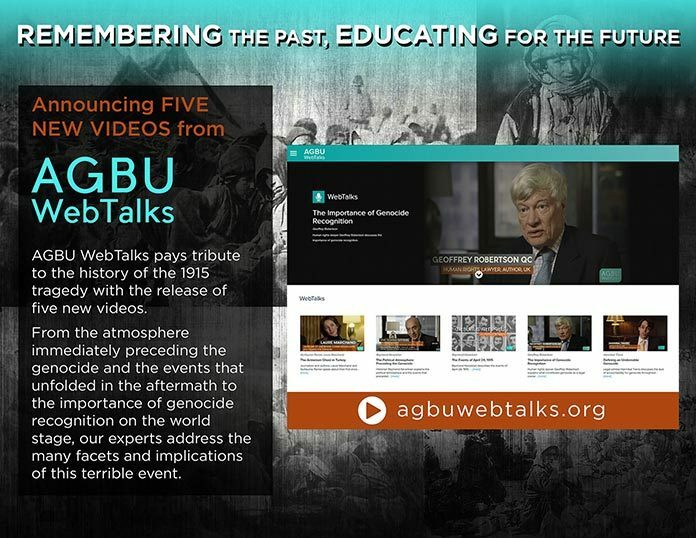 With these videos, AGBU WebTalks also seeks to create a rich repository of knowledge and provide easy access to reliable information to meet the demands of an increasingly connected and visual world. AGBU says since February, videos on art and music have been added and many more on a wide variety of topics are currently in production. To learn more about the AGBU WebTalks series and to watch the videos mentioned above, please visit www.agbuwebtalks.org.